Redstation Review 2019: Is Redstation a Good Hosting? Redstation is a dedicated server provider offering fully customizable servers at very affordable rates. They save you money by providing a fully-owned infrastructure with bare metal servers. Check out their specials for even deeper discounts. Redstation is a U.K.-based provider of internet-based services that include bare metal dedicated servers. They have eight privately owned data centers with over 20,000 deployed dedicated servers and over 3,000 miles of external fibre connectivity. They offer a range of fully customizable servers that can save you money over dedicated server hosting from other companies. Redstation offers a wide selection of bare metal servers that are faster than cloud servers and up to 10 times cheaper. Their infrastructure is wholly owned from end-to-end, meaning you’ll enjoy deep discounts and the stability of a company that doesn’t outsource their products. Redstation servers are easy to use and include a selection of a pre-built library of operating systems. You can also opt to install your own OS and software. Note that dedicated servers are not for beginners or most intermediate webmasters. Outside of auto-installation of your OS, there are no additional auto-setup tools, so you either need to know what you’re doing, or you need to find a solution more applicable to your skill level. Every feature on these servers is customizable. You can customize hard drive space, memory, RAID configuration, OS, cPanel software, server management, and more. On the E7 servers, you can even upgrade to a 10Gbps port speed, but you will pay a hefty monthly fee. If you’re looking to save some serious money, check out their specials on E5 and i3 servers. While you may be limited to a single data server, you can save 50% or more with their specials. Don’t worry; their specials include customization features, so you can still upgrade while saving money on the base configuration. Support for Redstation servers is standard with telephone and email support. They don’t offer live chat support at this time. Note that their scope of support is limited to infrastructure matters. They don’t provide any software support beyond resolving issues related to their servers. Dedicated servers are rarely considered inexpensive, but Redstation is an exception to the rule. Compared to similar companies offering the same services, Redstation can save you significant money on your dedicated server while providing you the customization options you need to run a successful website. 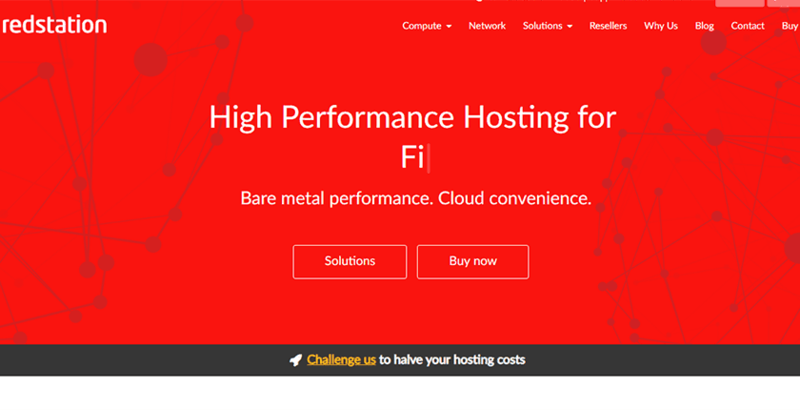 Wondering how Redstation stacks up against other Web Hosting companies? Enter any other Web Hosting company and we will give you a side-by-side comparison.